This week saw the return of The Great British Bake off and the first episode was all about cake. The challenges were angel food cake, sandwich cakes and a chocolate showstopper cake. 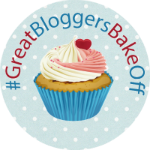 Each week Mummymishaps and TheCrazyKitchen are hosting a new blogger challenge, The Great Bloggers bake off where every week they will make a recipe from the show. My lovely cousins have been visiting from England this past week and while they were here one of them celebrated a Birthday. I had been asked to make a cake to mark the occasion and the request was for a chocolate cake. Perfect timing! So here we are, I give you, the chocolate overload cake! preheat oven to 180c. Butter and line two 20cm fairly deep sandwich tins. In a large bowl, mix together the flour, sugars & cocoa. In a jug mix together the eggs, sour cream and vanilla. In another large bowl, beat together the melted cooled butter and oil then stir im the water. Stir in the flour mixture and stir until incorporated. Add the egg/sour cream mixture and stir well again. Pour into the tins and bake for 50-55 mins or until a cake tester inserted in the middle comes out clean. Cool in the tins for 10 minutes then turn out onto a wire rack. Melt the chocolate in a bowl over a pan of simmering water, stirring occasionally until melted. Leave to.cool a little. Beat the butter until creamy, then add the icing sugar (if you are using a mixer, place a tea towel over it so you don’t get icing sugar everywhere not to mention getting choked by an icing sugar cloud!! Beat until very light and fluffy then pour in the melted chocolate and the vanilla. Beat once again until everything is incorporated and you have a gorgeous chocolatey bowl of deliciousness you won’t feel like sharing with anyone. When the cake is cold, sandwich the cakes together with some icing then ice the top and sides. You don’t have to worry about being really neat because it will all be covered eventually. For the chocolate collar, I measured the cake then I cut a piece of baking parchment to fit l around the cake. I melted 200g chocolate, placed the chocolate in a piping bag with a small writing nozzle, then drizzled the chocolate in a decorative fashion (well – as much as I could!) on the parchment. Ruth Clements of The Pink Whisk has a great tutorial on her blog. I followed her instructions and they worked really well. I was chuffed to bits with my chocolate collar! Once the collar was all set, I decorated the top of the cake with Thornton’s chocolate, Wispa bites, caramel buttons and edible glitter. oh my goodness this is amazing!! i cant believe you made your own chocolate collar! it looks so professsional – and i am very impressed. Your cake is gorgeous! I wish I were able to see GBBO. But I am going to check out the blogger bakeoff. Thanks for the links. it looks incredible 😀 Yummmmm chocolate!! Thanks! The GBBO is such a good show, it’s a shame they don’t show it the US. This week is bread week! That is a ton of chocolate! Yum!